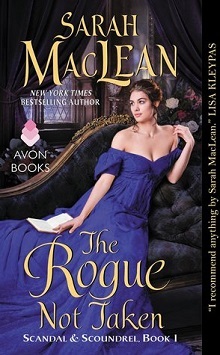 Sarah MacLean opens her new Scandal & Scoundrel series with The Rogue Not Taken, a wonderful introduction to a new series, and a perfect introduction to historical romance for those new to the genre. Using all of the foundations to build a good story: well-developed characters, compelling storyline, adventure and humor, and never gives much downtime. Sophie is the youngest daughter in a family that seems to attract and covet scandal. Daughter of a coal-miner who was titled by the king, she is frustrated by the suffocating convention (and hypocrisy) of the Tonne. When she catches her brother-in-law in a compromising position, she’s fed up and their verbal confrontation ends in a koi pond, she is given the cut direct by all who saw her outburst. She dashes out of the gathering, but must find a way home without sulking in the family carriage. 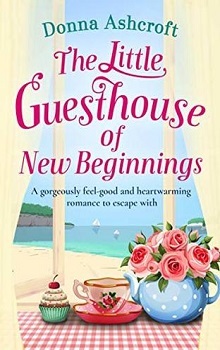 Kingscote, Marquess of Eversley and famed (if the scandal sheets have it right) for breaking up betrothals and then moving on happens upon Sophie hiding out in the garden as he, following his boots, climbed down the trellis. Seeing potential for escape, Sophie attempts holding a boot hostage for a ride back to Mayfair. Soundly rejected, she uses her wits, fearlessness and impulsivity to trade places with a footman, clothes and all. From here, the story mixes scandalous headlines, action, adventure, cross-dressing, robbery, bullets, pubic scuffles and arrangements that would turn proper society upside down as they gobbled up the stories. Using headlines that could be ripped from a current day tabloid, MacLean updates each new development with the best innuendos and rumor as fact. This story is warm, funny and engaging, and while some of the moments dip into silliness, MacLean fully embraces that lightness and joy, and the few somber moments are balanced nicely with the lighter moments, as characters are built, connections are forged as the story works to a conclusion that is inevitable to everyone BUT Sophie and King. Mixing secondary characters that add depth and the occasional tension-fraught moments, this was a read in one sitting far past my bedtime story, and I loved every moment of it. Both characters were so intransigent in their own self-made prisons, and so afraid to see what was standing in front of them, waving a big red flag and doing the jig. This just made the realizations sweeter and the ending more satisfying for everyone concerned. No Good Duke Goes Unpunished:The Rules of Scoundrels #3 by Sarah MacLean with Excerpt and Giveaway! They are – aren’t they? Thanks for stopping in – good luck!